Have you ever thought you might like to have a lovely spring wedding with yellow and gray accents? Here are a newly wed couple that chose those very colors for their wedding day. 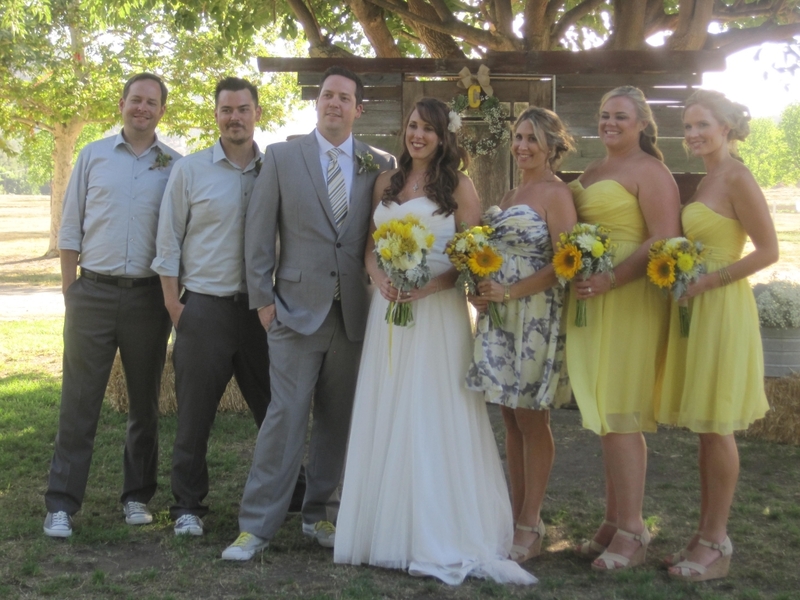 This beautiful ceremony took place at Bates Nut Farm in Valley Center, California. The style was casual and elegant. As their wedding officiant, it was fun to watch all the guests who were so delighted as this amazing wedding party walked in. . The groom was relaxed. Yes, he really was relaxed enjoying this time with his “men.” The bride was not only as radiant as she could be on her wedding day. There was no hint of anxiety or fear. As a wedding celebrant I might not be sure, but I suggest that their bright state of mind might have had a lot to do with seeing the bright hues of yellow everywhere. The matron of honor was pregnant and found the perfect dress to accent this “gray and yellow” wedding. The bridesmaids were cool, comfortable and happy in their flowing yellow dresses. Best of all the flowers amplified and extended the rich yellow colors of this bright and beautiful day!